Infection barrack. 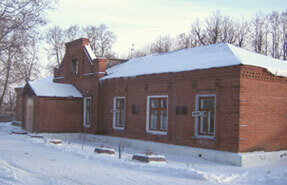 In the southern part of Pereslavl, near the Church of Purification, on the hill near the road there are wooden and stone hospital buildings of the city hospital. This establishment of great importance to the town was opened in the 1880s. The hospital was built to admit up to 30 patients and had a pharmacy. Obviously, the new building was not big enough and at the end of the 19th century another wooden building was erected in the hospital’s courtyard to separate contagious cases from other patients. A doctor’s consultation cost 10 kopecks then and the hospital’s inpatients were charged different amounts depending on their social status. Sometimes the Municipal Duma (Council) of Pereslavl decreed allocation of funds from “charity capital” to pay for “hospital treatment of poor and indigent citizens”. Today the building houses the isolation unit of the city hospital and is still generally spoken of as the “infection barracks”.